May 31, 2016 Linda Burton posting from Arkadelphia, Arkansas – The plan was to drive home from Jefferson City today through Mountain Home and Mountain View, Arkansas; after all, any place with “mountain” in its name has to have charm, right? The flaw in my plan was that I didn’t allow time enough to stay. The roads wind and twist in such a way as to force a leisure pace, on top of that, every turtle that had spring fever was ambling its way across the road. How many times did I swerve? It was already late when I got to the Ozark Folk Center General Store, where I met two of the sweetest (and costumed) ladies ever. We talked, and we talked. Before I knew it, I was headed up the steep hill towards the gift shop, where (they had talked me into this) I would find my own Squirrel Circus, handmade by a genuine Ozark craftsperson. Sure enough, the elaborate whirl-a-gig device was for sale in the Homespun Gift Shop, and sure enough, I bought one. It was clever, I thought, a truly ingenious invention. Now here I am, back home, with a Crafts Village Map in hand, an Ozark Folk Center State Park Calendar of Events, a Visitors Guide to the Stone County area for 2016, and, one new-wood smelling Squirrel Circus. What to do? I have to go back, despite the challenges of the roads. I want to go back. 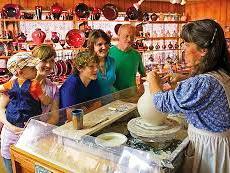 Consider this: I visited the General Store and the Homespun Gift Shop. On the map, those two building are on the extreme left of the Crafts Village. Had I driven a bit further, I would have reached the Auditorium, which seats a thousand people, with both a Main Stage and an Outdoor Stage. Beyond that – Old Time Print Shop, Quilting, Cooper/Woodcarving, Spinning/Weaving, Dye Shed, Music & More, Clothier, Candle Shop, Plant Market, Gun Shop, Jewelry, Brooms, Dolls, Baskets, Art Guild, Leather, Blacksmith, Apothecary. Those are small spots on the map; larger buildings indicate Pottery, Glass, Copper, A Music Pavilion, A Root Cellar, A Smoke House, Young Pioneers and Kids Garden, The School House. Far to the right of the map is the large Skillet Restaurant, with a Kitchen Garden out front (open April-November 7 days a week). A Conference Center, small auditorium, and administrative offices are off in that direction too. The Bois d’ Arc Conference Center is near the General Store; an arrow points to the Cabins at Dry Creek, somewhere off the map. What goes on in all those places? Crafts classes, to be sure, and workshops. But mainly, it is music. A sample, just for next week. Every day: Daytime Musicians, A Noon Program, An Evening Program; the acts change daily. Saturday June 4 features Love Holler, Side Steppers, Jeanette Larson, Possum Juice, Samuel Blake, Flat Broke; Sunday’s concert features Fog on the Mountain. 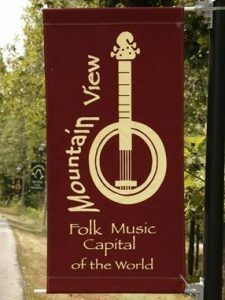 Upcoming events: Annual Autoharp Workshop; Farmstead Cheesemaking; Basic Letterpress Printing; String Band Camp; Mountain Dulcimer Workshop; Hammered Dulcimer Workshop; Sheep to Shawl; Painting the Bob Ross Way; and concerts, concerts, concerts. 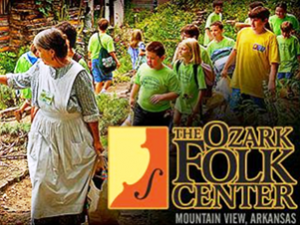 The Young Pioneers have hands-on programs for kids 7-14 for Ozark crafts and music. 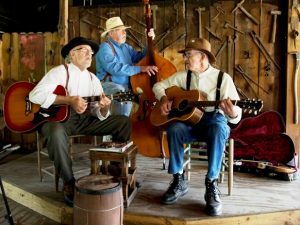 Looking ahead to September and the beginnings of fall color, Labor Day weekend has a tribute to Grandpa Jones and banjo workshops; October has the Herb Harvest Festival and Beanfest; November is the annual Fall Bluegrass Festival and then a Thanksgiving Day Buffet and Gospel Concert. Good heavens I am exhausted just reading about all of it. And I haven’t even picked up the 44-page Visitor Guide. 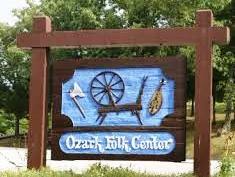 Their mission is simple: to perpetuate, present, and promote the Ozark way of life in an educational and enjoyable manner, through craft demonstrations, musical programs, the Heritage Herb Garden, workshops, and special events. Meanwhile, I’m keeping my suitcase out. And oh yes, I’ve got a Squirrel Circus to install in my backyard. I’ll let you know if it works.